During their mission to the Lamanites, Ammon and his brethren journeyed south from Zarahemla to the land of Nephi. Ammon went to the land of Ishmael (see Alma 17:19), where he taught the gospel to King Lamoni and his people. Aaron and his group went to Ani-Anti and down to Middoni (see Alma 21:11–12), where they were cast into prison. Alma and Lamoni later met them in Middoni and delivered them from prison. 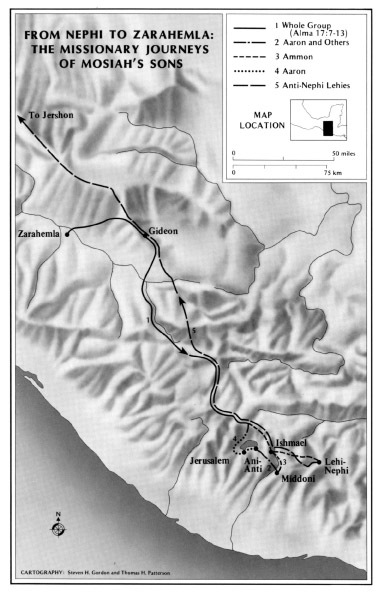 Later, the people of Ammon journeyed north from Lehi-Nephi to Jershon (see Alma 27:23). This map places the land of Nephi in highland Guatemala. The place where Ammon and the others separated may be what is now known as Los Encuentros, an ancient meeting point of paths running in four directions (and a highway junction today). The ancient American city of Jerusalem was likely located near some body of water, for Jerusalem was submerged at the time of Christ's crucifixion. Though not proven as of yet, the correlations between certain archaeological ruins and Lamanite cities make this general depiction attractive.